Welcome to the Brain Stimulator Family! The Travel Model is not a medical device and as such, it has not been reviewed or approved by the FDA. 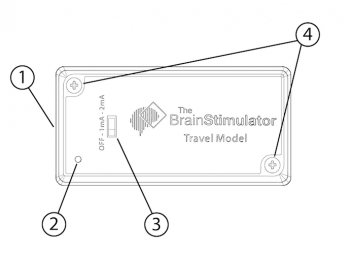 The Travel Model does not claim to diagnose, assist, treat, improve, cure, or prevent any medical condition or ailment whatsoever.The Brain Stimulator, Inc. does not make any recommendations or claims with the sale of this kit, and what you do with it is your sole responsibility. Do not use Transcranial Direct Current Stimulation (tDCS) if you have any metal or electrical implants such as a pacemaker, or have a history of seizures. Do not use tDCS unless you have a full understanding of tDCS and have spoken with your primary care physician regarding any risks or concerns. By using The Travel Model product you agree to these terms and conditions. (1) Electrode Port – For connecting the electrode cable to the device. (2) Blue LED – Indicates that the output current is flowing, and flashes when the battery needs to be replaced. (3) Selector Switch – For turning the device on & off, and for selecting the output current level. Battery Installation For best results, we recommend using a brand new, non-rechargeable 9-volt battery. To install the battery, begin by unscrewing the two black screws on the top of the enclosure. Remove the lid and attach your battery to the pre-installed battery snap clip. Carefully route the red and black battery wires down the edge of the case and around the small post near the rear of the case. Before you place the lid back on the case and reinstall the screws, be sure that the wiring is not passing over the top or bottom of the battery, as this could make reinstalling the lid difficult. Take the white electrode cable supplied with your kit and insert the right-angled plug into the electrode port at the top of The Travel Model. On the opposite end of the cable, you will find your electrode connectors. The Red connector is the Anode (positive, stimulating electrode) and the Black connector is the Cathode (negative, inhibiting electrode). You will need to differentiate the two connectors when you begin looking at electrode placements. If you purchased the Basic Kit, your electrode cable will have alligator clip connectors, which you will use to clip onto the included sponges. Please ensure that no metal parts of the alligator clip touches the skin during stimulation. This can be avoided by inserting one prong of the alligator clip into the side of the sponge, or by clipping onto the top of the sponge. If you purchased either the Advanced or Deluxe Kit, your cable will feature banana plug connectors, which insert directly into the side of the included sponge electrodes. We designed the connection to fit snugly, so you may need to use firm pressure to insert the connector plug. When disconnecting, grip the rubber connector, never pull by the cord. Note: Both the Alligator Clip and Banana Plug cables can be purchased separately in our online store. Saline solution is an important factor in improving conductivity and ensuring a comfortable and effective tDCS session. Prepare saline solution by following the instructions featured on the back of your saline solution applicator bottle (available in our online store), or by mixing 1/8 teaspoon (approximately one pinch) of salt, with 8oz of water in a cup. Generously apply the solution to the yellow sponges, until they are thoroughly saturated. If you plan to position your electrodes on any bare-skin, non-hair covered areas, wash the target area beforehand removing any dirt, oil, lotion, makeup, or any other products which may have been previously used on the area. Identify the electrode placement you will be using, and position the electrodes accordingly with the sponges against the skin. Be sure not to reverse the Anode & Cathode positioning, as studies suggest this has a potential to produce opposite effects. Secure the electrodes in place using a headband or other fastening material. For best results, the electrodes should be pressed firmly against your body, and saline solution should saturate through any hair, reaching the surface of your skin. Deciding where to place the electrodes for your tDCS session is very important. Scientific studies focusing on tDCS have shown that different electrode placements, more commonly referred to as “Montages,” produce different and unique results. Everyone’s situation and desired goals with tDCS are different; therefore we cannot specifically recommend any one particular montage. It is up to you as the user to do your own research to determine how you would like to use tDCS. Please note: The Brain Stimulator, Inc. is not responsible for content located on third party external websites. Sliding the selector switch to the right will turn on the device and ramp up the current to 1mA. The blue illuminated LED indicates that the device is on and that output current is flowing. Once you feel comfortable, you can continue to increase the current level by sliding the selector switch to 2mA. We recommend pausing at each current level for 15-30 seconds, or until comfortable, to provide for a smooth transition. Lower the current level using the selector switch. However, If you ever experience a sensation which you are uncomfortable with, stop your session immediately by sliding the selector switch to the “OFF” position. When concluding your session, slide the selector switch to the “OFF” position. Just as with increasing the current, when decreasing the current it’s best to pause momentarily at each current level to provide for a smooth transition. If you purchased the Basic Kit, it is a good practice to rinse out your sponges after each tDCS session, attempting to remove as much saline solution as possible. After rinsing, squeeze out any remaining liquid, and set aside to dry. If you purchased either the Advanced or Deluxe Kit, you can extend the life of your electrodes by cleaning them after each tDCS session. To clean your electrodes, start by unplugging the cables by pulling from the plug (not the cable), and removing the yellow sponges from the rubber encasing. Rinse the sponges under water, attempting to remove as much saline solution as possible. After rinsing, squeeze out any remaining liquid, and set aside to dry. Additionally, it is also a good practice to rinse clean the rubber encasing and metal mesh after each tDCS session. We suggest rinsing each part separately, by removing the metal mesh from the rubber encasing. After rinsing, use a paper towel to dry both the encasing and metal mesh. The metal mesh should be completely dry when finished. Once again, we would like to thank you for your purchase and to welcome you to The Brain Stimulator Family!